In the first post I described the sequencer, a circuit that provided discrete timing signals to space operations apart. In the second post I mentioned the Timing matrix that was run by these signals and orchestrated a dance of control signals in time. This article is about making it all alive and kicking within an FPGA solution. To make that happen, we need to design a simple "board" that contains our CPU, add some ROM (to hold the boot code), RAM (for the stack) and, well, let's pick an UART as the simplest IO we can implement and to let the design expresses itself through it! This project is hosted on Bitbucket: https://bitbucket.org/gdevic/a-z80. You can download it and start reading project's QuickStart document or the User's Guide. The folder "host" contains a definition of a board described here. The folder "tools/zmac" contains Z80 assembly-level code to run. In this case, we will run a test program that will print "Hello, World!" through the UART and using a simple CP/M software interface. Update: I have switched to using the Altera DE-1 board since the FPGA board shown above was missing the external static RAM memory. SRAM is very simple to use and needs no controller code like the SDRAM does; it is a crucial component if you want to implement a retro computer such as Sinclair ZX Spectrum. After several rounds of practical improvements - for example, adding a reset button, de-bouncing it and slowing the clock down so my logic analyzer can capture signals - the FPGA was still behaving strangely. 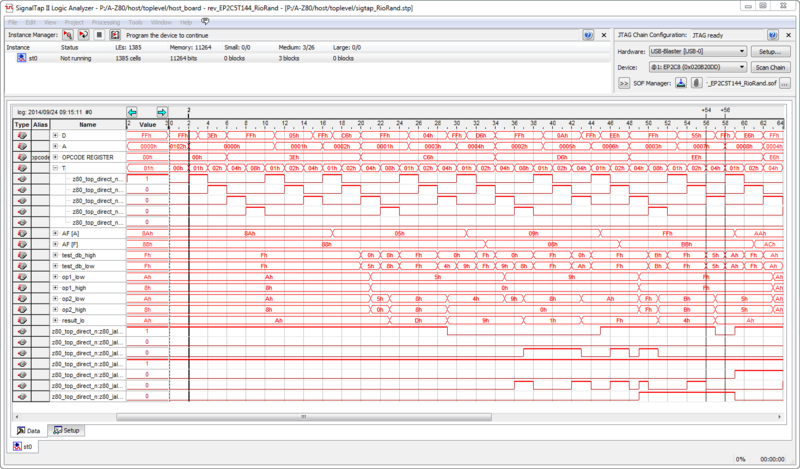 The FPGA timings are very unpredictable when you are trying to use latches: the synthesis tool routes signals by its own algorithms and there are delays which make control T-cycles and clocks overlap in strange ways. In contrast to custom ASIC, you can't simply add gate delays and count on it. A latch would close on a next clock and then store a wrong value and so on. RTL simulation would not show any of that. So, I went back to the drawing board. Luckily, it turned out only a handful of blocks needed to be modified: the address latch; data gates and, in general, I switched from using latches to edge-triggered flops for most internal flags and memory cell bits. I don't know how well will that compare to the real Z80 once it is better understood, but for now - this design works. Update: I ended up porting all latches to flops and fully constrain the design (using SDC files). With that done, the timings were fully met and the design became very stable. 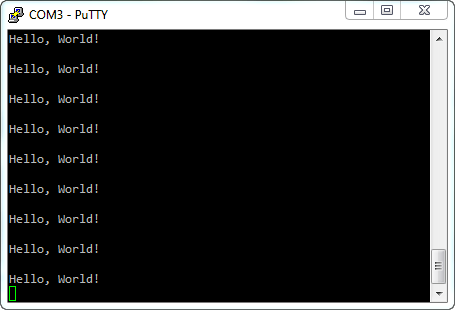 Here is, at last, a "Hello, World!" on a terminal! 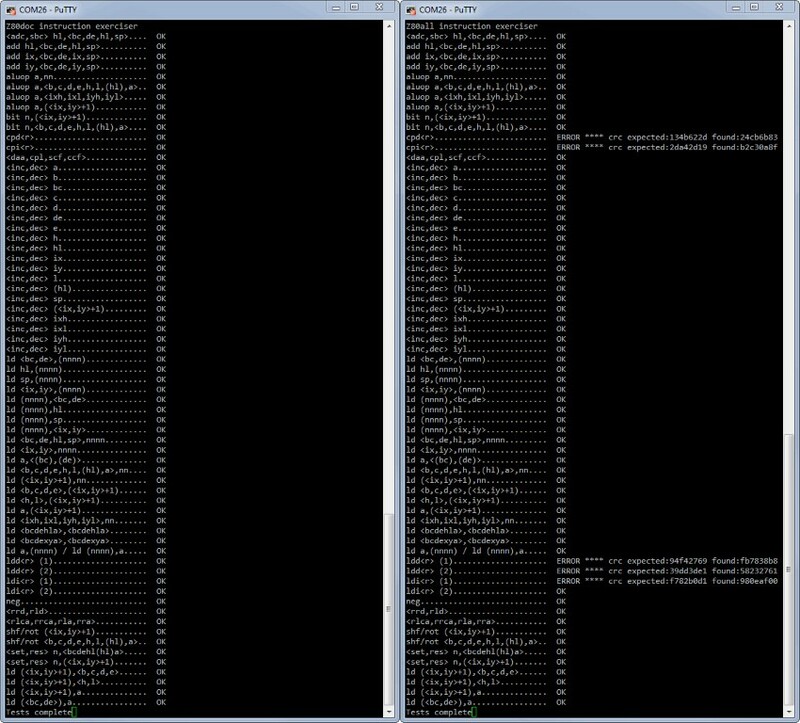 I loaded and run "ZEXDOC" and "ZEXALL" test programs that exercised Z80 instructions. All documented and undocumented instructions are passing but only the quirky undocumented CPIR and LDIR family's IX and IY flags are not correct. This presents no practical problems with any code.